The history of twentieth century antiquities collecting cannot be written without mentioning Ed Merrin, former owner of the Edward H. Merrin Gallery on Manhattan’s Fifth Avenue. Although he began in the trade by buying and selling pre-Columbian antiquities, he soon branched out into dealing in works from ancient cultures across the Mediterranean, as well. His discerning eye and voracious acquisition of knowledge established him as the preeminent dealer in the field. His dynamic personality was, at times, exhibited in auction houses like Christie’s and Sotheby’s, and documented in national publications like the New York Times for decades. Under the leadership of Samuel Merrin, son of Ed and heir to the re-named Merrin Gallery, the gallery has continued in its acquisition and sale of some of the world’s rarest and finest antiquities. Samuel is the beneficiary of the many resources his father acquired through his years in the industry. In the 1970s and 1980s, Nelson Bunker Hunt and William Herbert Hunt tried to corner the international silver market. This reckless scheme eventually led to their declaration of bankruptcy and the U.S. Bankruptcy Court-ordered liquidation of their art assets. Sotheby’s held the first such sale of the Hunt brothers’ collections in 1990. In December, the New York Observer reported that Ed brought the auction to a record-breaking fever pitch when he secured an Etruscan bronze horse with a bid of $517,000. The excitement continued when Ed purchased a male and female pair of Roman bronze heads for $525,000 and $280,000 respectively. Mr. Merrin’s bids at this auction helped drive the net proceeds of the sale to an astonishing $11.4 million. 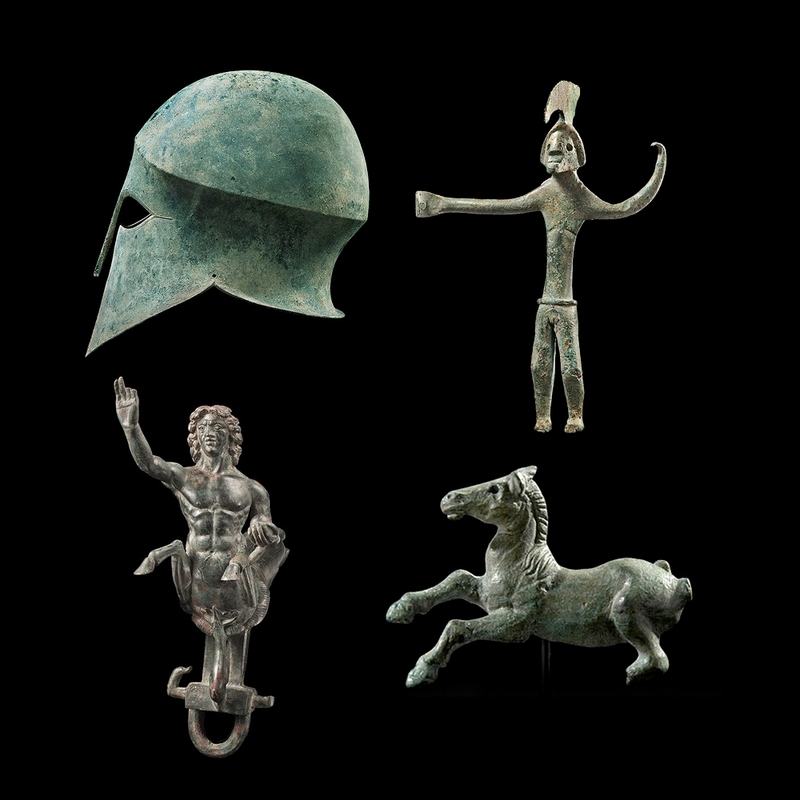 Ancient Bronze art at the Merrin Gallery: a Greek helmet (5th century BC), a Italic warrior (8th–7th century BC), a Roman triton (1st–2nd century AD) and a Greek horse (3rd–1st century BC). Another eminent antiquities dealer, Robin Symes, also garnered attention at the Hunt Brothers sale by acquiring “A Fragmentary Attic Red-Figure Calyx Krater,” ca.510 BC, bearing the signature of Euphronios, for a whopping $1.76 million, more than double the original estimate. Ed Merrin and Robin Symes have often been rivals in the heated antiquities auction world. 1989 saw a public bidding showdown of unparalleled drama between these two titans of antiquities in the auction room. According to the New York Times, a nine-inch Cycladic marble head, an object noted for the remarkable preservation of its ancient face-paint or tattooing, was the subject of their sensational bidding duel. Merrin’s $2.09 million bid beat out Symes’ lower bids on behalf of the J. Paul Getty Museum, and emphasized the singularity of the Cycladic head. 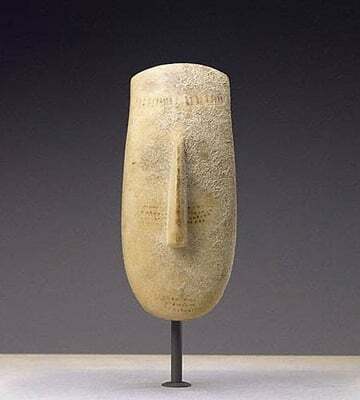 A large Cycladic marble head, dated circa 2600-2500 BC. Sold by the Merrin Gallery to the J. Paul Getty Museum. Although Ed Merrin is now retired, his passion for great antiquities is unabated. He consults with his former clients, both private individuals and museums. And he continues to share his enthusiasm and expertise with his son, Samuel, and his son-in-law, Moshe Bronstein at the gallery.